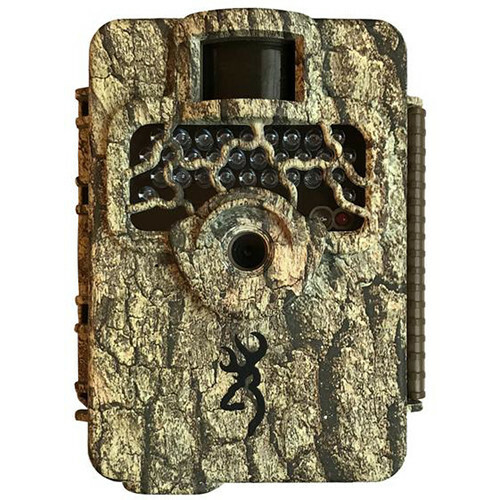 With its half-second trigger speed and 75-foot flash range, the Browning BTC-4P-16 Command Ops HD Trail Camera will serve as a reliable scout for your hunting grounds. This 16MP camera's infrared flash won't spook game at night, and its Illuma-Smart technology adjusts the IR flash as necessary for optimal photo quality. Time-Lapse Plus shooting mode captures images at pre-set intervals, and Browning's Buck Watch Time-Lapse Viewer Plus software (available as a free download) stitches the time-lapse images into a video so you can watch a whole day's comings and goings in a few minutes. The camera can capture up to eight images in Multi-Shot mode and four in Rapid-Fire mode, providing multiple looks at game (or people) on your property. Photos and videos are recorded on a user-supplied SD memory card up to 32GB, and Browning's SD Card Management will overwrite older images when the card is full. The Command Ops HD Trail Camera runs on eight AA batteries.